Jobvite Review: "Great Recruiting software"
At my marketing firm with a large global footprint, we are interested in attracting the best talent from anywhere possible. We use Jobvite as a software tool to aid us in recruiting efforts. The HR department is the primary consumer, using it for the entire pipeline of job posting, applicant screening, applicant tracking, and extending hiring offers to candidates. Jobvite allows users to configure it to match the branding of the recruiting firm, thereby providing the same look and feel as the company's main portal. Providing us visibility into the entire applicant tracking process makes it a huge win for our company. We've seen issues where people who are trying to access the job listings on their mobile phones see the loading bar for a long time without the results actually appearing. Using filters to narrow down job listings can be buggy sometimes as well. Jobvite is great for offering visibility into the entire applicant tracking/hiring process. It can allow managers to configure workflow scenarios to handle multiple candidates and transfer them through to the next stages of the process. Applicant tracking systems have come and gone at our company. With Jobvite we are able to make our image to the applicants much more streamlined. Much of our need was to make the experience quick and painless when applying for a job, will still being able to gather the applicant's profile details. Many times our organization experienced a drop off in applicants during the application process. Taking the applicant profile and allowing them to create the profile and apply for the job at the same time was a huge win. Integrating calendars for managers and interviews has been a huge help as well. Jobvite Review: "Solid tool and upgrades, but always room for improvement." 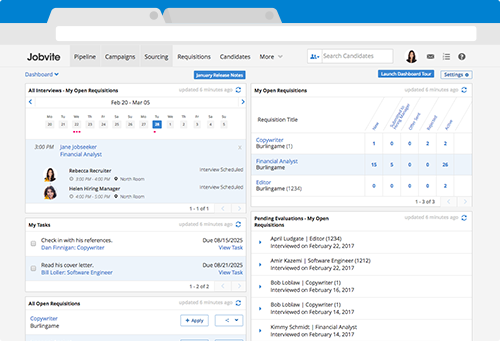 Jobvite was rolled out as a new applicant tracking system for primary use in our Human Resources department. We've given employees the ability to share job postings, and hiring managers the ability to see applicants for their own open positions -- so in a sense, it's being used by the entire organization. It helps us streamline the application process and the candidate experience, and ultimately hire quicker and more efficiently. Sharing job postings is great. Spreading the word to internal and external networks of our job postings is great to get exposure and create awareness that we might not otherwise be able to do. Allows access for managers to see their own applicants to their own positions. This saves us recruiters time to do other pressing projects, while allowing managers to not wait for recruiters to get around to viewing their applicants. It cuts down on wait times. The layout and user interface is streamlined, easy to follow, and easy to use. This helps those that are less tech-savvy figure out the system quicker and cuts down on redundant steps for us recruiters, so it saves time and wasted efforts. Some of the functions and commands could be more linear, rather than taking you out of the logical step in a process and then having to back-track. This isn't a huge issue, but there are times where you have to back out or close something in order to get to the next thing. The wait time after clicking on an icon or doing a command is sometimes unusually slow. If I click on an applicant's profile to see information or a resume, it can take 10 or more seconds for the system to process and bring up a new window. This issue has been raised by my company, but so far no solution has been rolled out. Some of the self-guided tutorials and webinars could be shortened or made more interactive to ensure the content is retained. Jobvite is good for all employees of an organization to share job postings on their professional and personal networks. Word of mouth and spreading information is much easier with Jobvite now. Also, allowing managers to see their own applicants for their own open roles is useful, as they don't have to wait for us. It's not as appropriate for those that might be less tech-savvy, as there are some learning curves and an abundance of customizations that may overwhelm some. Jobvite Review: "Great for Talent Acquisition"
At my current organization, we've had the need of recruiting software professionals from across the globe to support our product services. Jobvite, as a cloud-based applicant tracking system, enables us to manage the entire hiring process including job distribution, screening, interviewing and sending out offers to prospective employees. It is highly customizable and we can brand the website to make it similar to our company's theme. Using Jobvite as a centralized portal for talent acquisition is a great win for us. We've had issues trying to configure workflows for hiring manager approvals using this software. The mobile app features could be improved. I think we've gotten excellent mileage out of this software tool. It's a great product to help any HR department with the talent acquisition side of the house. Jobvite Review: "I would look at other options"
We needed a cloud-based ATS that could screen applicants but not automate the process completely. We needed something quick, concise and easy to use. We used it across the entire organization. Many of our users do not hire regularly so we needed a system that was very user-friendly and would help them along the way. It's just so clunky. If you have never used an ATS before, this might not bug you but it's slow and clunky. Jobvite seemed like it would be a great solution. It really wasn't for us. Emails sometimes would never send. Sometimes it would send rejection letters to whole pools of candidates. It was very unreliable and very frustrating. Jobvite Review: "Slick UI and comprehensive feature set"
Jobvite is used globally in our 19 offices. It does a great job of streamlining recruiting. Great user experience. Easy to use. Integrates with G Suite well to make scheduling interviews and responding straight from email seamless. It would be nice to make emails formatted more aesthetically pleasing for Jobvite Hire. It could be easier to search for issues in their support system. They've had some issues with upgrades and performance but usually iron them out. User Review: "Jobvite does the job!" We use Jobvite primarily for its ATS capability. It is primary used by HR in the recruiting function. The Jobvite tool helps provide us with recruiting solutions for managing the entire hiring process. I can track candidates easily, create reports, schedule interviews, etc. It truly goes beyond your typical ATS. The HireRight background integration in Jobvite is great as you can initiate background checks from the ATS itself. The features are innovative, easy to use, and really helps to streamline the hiring process. Reporting tools. You can create customized reports in this ATS from candidates in your current pipelines in certain requisitions to offer declines over a past year. Scheduling Tool. Jobvite integrates Google Calendar which makes it easy to schedule interviews in Jobvite itself. Social Recruiting. You can easily post positions out to your LinkedIn/Facebook/Twitter network. Tech support via chat. There are some instances when it takes awhile for a representative to help out via chat. When modifying a interview schedule, I wish the tool would automatically update the schedule when I make a change to one person on the list. I think Jobvite Hire ATS is great for startups and mid size companies to use. The tool is easy to integrate and the user interface is simple to use. If you're looking to streamline your hiring process seamlessly, Jobvite does the job. User Review: "Jobvite User and Implementor 4X!" We currently use Jobvite across all functions and geographies to support the hiring. This includes requisition creation and approval, candidate submissions, resume routing (to managers), interview scheduling, feedback collection, offer creation, approval, extension. 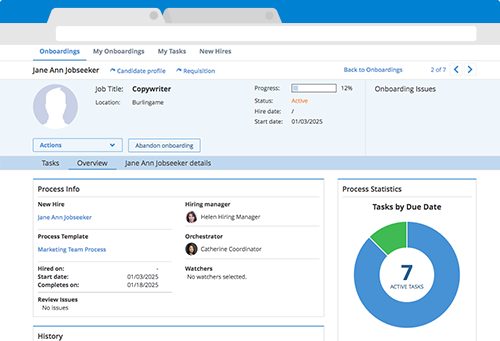 The tool integrates with Talentwise (our background check partner) and integrates with our HRIS system for on boarding. Additionally, we use the reporting tool within Jobvite for reporting. We also use Jobvite for employee referrals and publishing requisitions to various job boards and linkedin. Employee Referrals - Simplified and streamlined process for employees to post jobs and refer candidates. Manager Interface - Fairly intuitive UI that allows managers to review resumes and provide input on the hiring process. Integration - Jobvite allows us to simply connect the hiring process with our HR applications vendors/partners (Background, HRIS, etc). Reporting - Very hard to use. Standard reports are not particularly helpful and custom reporting tool takes trial and error to get what you need. Its evident the reporting was created by an engineer and NOT a staffing person. Getting a "reporting council" or advisory panel to re do the reporting aspect would be FANTASTIC. Customer Support - It has improved a bit over the last few months but often times you have to send follow up requests to get issues resolved. "Please post [your question] on the feature request forum" doesn't lend itself to a great experience. Jobvite has a fairly simple implementation process so it is good for companies looking to make the move from an email and folders type of hiring. Where it falls short is on the reporting side. If you have a company that is data driven this may not be the best option. Jobvite Review: "Overall the best solution for my team"
JobVite is being used as the ATS at InfoReliance, in the traditional manner, for requisitions, applicants, tracking, scheduling, etc. It is also used in its social recruiting capacity for all employees. It is also used as a searchable database for employee skills knowledge and abilities. One of the main things that is an area for improvement is that the system is requisition-focused rather than candidate focused. For example, if a candidate has been considered for multiple jobs, one of the most important things for a recruiter would be to have easy access to other teammates notes on the candidate, and to review past actions on the candidate. Now, you have to click separately on each requisition and hunt for any notes. Back to my first point - the number one thing that would improve the product is for contact profiles to include all notes by requisition in a dashboard so that a recruiter could review the full history. There are so many factors to take into consideration. For very large enterprises I would likely consider Oracle/Taleo, ICIMS, etc. For very small organizations, I might consider a low cost solution like CATS. Level of automation required, candidate volume, reporting needs, ability to provide administration or customization - these are all critical questions, but it really comes down to workflow and ease of use. For my needs, the only true competitor to JobVite is the Newton ATS. "Jobvite - Reviewed by a Recruiter"
The entire Recruiting function uses Trulia for all of our Applicant Tracking System needs. Hiring Managers and interviewers are entering in their feedback, seeing resumes, and accepting calendar scheduling. Overall, it is a good ATS and they take feedback well if there are issues. Review: "Jobvite is where it is at when it comes to ATS that are modern, elegant and easy to use." I used Jobvite at two startups (HubSpot.com and Communispace.com). I ran recruiting for both companies at the time. It was used across the organization to hire the best possible talent. Infiltrates networks to find the best candidates within an employee's network. Ease of use for non-technical staff. I have no suggestions for improvements. They also have great software support. I think Jobvite is particularly well suited for startups and smaller companies. Far fewer clicks to get things done than an enterprise ATS and the interface is just super elegant and intuitive. Our organization previously has had no experience with an ATS, and recently decided to move forward with Jobvite, having just completed implementation. Prior to implementing an ATS, we knew we were going to need a solution to address the ever-increasing hiring volume, not to mention recruiting efforts. Out of a need to better organize our recruiting process among a mult-site organization, and to streamline our processes while keeping the candidate experience intact, we knew an ATS was in our near future. The Jobvite subsidiary product should allow more customization for internal processes of subsidiary companies. Consider heavily your organization's policy and view on social media recruiting before moving forward. Jobvite is currently being used as the main ATS system at Logitech. Managers and our in house Talent Acquisition team use the system to hire new employees. At this point I haven't encountered any issues with the system. Our Workday and Jobvite req sync has been quite the challenge. I would recommend the team look into making this transition easier. Jobvite Review: "Solid ATS with room for improvement." Jobvite is being used across our entire organization for recruiting, reporting, interviewing, & hiring talent for our organization. The new jobvite UI is a great tool to be able to create a snapshot of any req at a given point in time. Social integration. Being able to quickly share your openings on Linkedin, Twitter, & Facebook. I like how you can submit active candidates straight to the hiring manager through the req. The managers interest one or another is capture within the ATS and makes it easy to disposition from there. Scheduling phone interviews. You can easily schedule phone interviews within Jobvite and have the invite pop on the interviewers Outlook. At other companies I would have to record the time within the ATS & schedule to Outlook. Search. Not a huge fan of the search results within Jobvite. I would like to be able to see the current company, school, & location from the search view within having to click through every single candidate. Interview feedback template. I wish you could have customizable feedback templates for different parts of the organization. I enjoyed using Jobvite. Our HR department transitioned from a different program and that part was not as smooth as I would like but after employees got acclimated, it was great. Jobvite has features that can replace other data. The connection from Jobvite to other outside media and outsourcing is the best in the industry. Easier transitioning from current ATS to Jobvite. More comparitive questions and questions around cost. JobVite was used during the recruitment process, from sourcing to final interview feedback. Recruiters were able to send candidates to hiring managers (across all departments) and receive feedback through JobVite and employees were able to submit referrals (either directly or through social media). We were able to integrate social media into the recruiting strategy for sourcing and internal candidates. Ability to share jobs across multiple social networks. It's important to be able to do this in one click versus copying and pasting multiple times. Clearly receiving feedback from hiring managers. Templates can be customized for each role, level and department to allow the hiring managers to clearly communicate feedback and next steps, eliminating a lot of unnecessary back and forth. Ease of employees submitting referrals. The companies where I used JobVite were very focused on interviewing all internal referrals and being able to easily identify the source was very helpful. Inconsistent functionality in certain browsers. One browser would work well for 3-4 weeks and then I would have to switch (i.e. Chrome to Firefox) for a week before being able to switch back. Difficulty uploading PDF files. Frequently had issues with the system being unable to read/upload PDF files. Reporting. Difficult to capture reporting data. Often had to supplement, and perform double data entry in spreadsheets, to capture necessary data. JobVite makes sense for companies who are in the social media, marketing or advertising spaces and want to capture those candidates. JobVite is linked to sites where those people live online and makes it very easy to share on Facebook and LinkedIn. The clarity around applicant source is also helpful for companies focused on internal referrals, paid job boards or any other source that needs attention. Jobvite Review: "One of the best ATS!" It is being used across the organization for recruiting and sourcing purposes. It is mainly used by the recruiters or talent acquisition supervisors. I also used Jobvite with my previous employer, Office Depot Business Solutions. Personally, I like using Jobvite. It is better than other ATS that I have used and currently use now. There are not a lot of steps that you have to go through in order to see the applicant's resume. It allows for quicker sourcing and tracking. Software is up to date! I guess my only suggestion at this time would be to keep it simple and easy to maneuver around. I don't have a lot of time to review resumes, and I have to review several daily. Jobvite Review: "Is It Perfect? No. But Show Me an ATS That Is." Jobvite is primarily used by our Recruiting Team as an Applicant Tracking System. It is also used by Hiring Managers to input interview feedback and internal employees to submit referrals. It is used to help organize and track candidates that apply for jobs with the company and like with any ATS help us in our efforts to stay compliant with State and Federal Laws when it comes to fair and equal hiring practices. With Jobvite I have the ability with my hiring manager's permission to show them how they can link job openings on Jobvite to their Linkedin accounts so that they can blast any opening within the company to their Linkedin network. I can leverage my Linkedin, Facebook, and Twitter feeds to Jobvite to connect my social network to openings within the company. I personally have found the reporting function to be cumbersome and not user friendly to the degree that I would like. I have worked with several different ATS systems in the past and haven't worked with one that I love including Jobvite but it is the best that I have come across so far. If running reports out of the next ATS System you invest in is a key functionality you are looking for I would make sure you are happy with what is provided. There are lots of choices when it comes to investing in an ATS and I would make sure you compare it to at least two others to make sure you feel like you are getting the best bang for your buck. We use it as our ATS. Just the recruiting team uses it. JobVite allows recruiters to work with multiple hiring companies. List open jobs in a EZ format. The messaging system doesnt seem to work right. Notifications are not the best, see #1. I have seen worse systems with bad UIs. JobVite is clean and easy to use, just not the best. Jobvite was being used to address recruiting needs across different departments and office locations. We needed a tool that could handle multi-department job tracking, job attribution tracking, and API access for a branded job site. By using Jobvite, we could centralize hiring across the organization and maintain analytics and consistency in the hiring process. The API documentation and endpoint was easy to understand and interface with. From a development standpoint, it was easy to work with. Their customer support was very helpful when it came to customizing our account with the branded career page. They redirected their tracking links to our career page but maintained full attribution, which was great for our needs. User access control made it so that different departments could use the tool with ease. I think that creating a Wordpress plugin would net them a lot of business. It was nice they gave me API access so I could do it myself, but it would have been simpler if they had already done the work. It would also simplify integration with future customers and their own websites. Getting API access requires contacting support to retrieve the Sandbox and documentation, at least when I used it. It's great when companies have this documentation posted for easy reference and transparency. I think Jobvite is a great solution if you want a branded job board hosted on your own website. User Review: "Jobvite, It's Okay...."
We use Jobvite to manage our staffing and recruitment activities. Would be great if we had a dedicated personal representative to contact. Managers and employees who use it have trouble with the system. It doesn't work with certain versions of Internet Explorer which our company uses. Jobvite is well suited for companies who allow social media company wide. Because our company is in the health care industry, we have limitations in accessing the net company wide. Review: "Jobvite - You get what you pay for and it happens to be relatively less expensive than most ATSs." Jobvite is our Applicant Tracking System, although that name is a misnomer since it doesn't actually track applicants, it tracks requisitions. You can post positions through several sources at one time. Not too complicated for the user. Jobvite's customer service is non-existent. I think they may have grown too fast so their Sales Department was well-staffed, but their Customer Service didn't keep pace with sales. Their product tracks requisitions, not applicants. Therefore, if you have a staff with different recruiters who may be recruiting from the same pool of candidates, each recruiter will have to learn for themselves whether or not the candidate is worth considering versus being able to get feedback from notes on the candidate. Jobvite's management is very inflexible. It's okay if they don't live up to their end of the bargain in terms of customer service, but if you want to change a service you are getting you'll have to wait until it's time for contract renewal time. This might sound reasonable on their part, but if you made the mistake of signing up for auto-renewal it could come back to bite you. Jobvite is not a good product if you have multiple recruiters who may be swimming in the same pond for candidates. I used Jobvite at a previous company and the product was mainly used in the HR Department to track candidate's personal information into the system. The system allows you to store information about candidates that did not meet the hiring standards for future consideration. The system can become more user friendly by perhaps combining all requisition in one single view or by adding more colorful icons. The availability to send attachments such as offer letters, employment verifications, I-9 forms from the system and/or the accessibility for the system to send quick reminders as to when an interview is due and so forth. Review: "Jobvite isn't for everyone. Know what you need before researching ATSs." Jobvite is our company's applicant tracking system. Jobvite is synced with our career site and it is the method in which we receive all of our applications. We also use Jobvite as our internal job posting and hiring portal. We are able to send internal job notifications through Jobvite and collect internal applications. Our employees are able to setup a publishing tool that automatically posts our jobs to their social networks on a regular basis. The frequency of how many times they get posted is determined by the employee. We have also been using their Engage tool which is primarily for sourcing. It's an additional cost and priced per user. Engage allows you to apply boolean search logic to search the open web for resumes. It's not the best technology we have seen so we are not utilizing it and have decided to go with another company to do this for us. They also have a Talent Community where you can either use their widget and add it to your site or build landing pages for the widget and customize it for each hiring event to collect resumes. It's a pretty good CRM tool. Social media recruiting. Their publisher app allows employees to very easily set up their social media pages once to automatically post jobs to their feed and they never have to update it again. It makes it easy for our company to get applications from employees and our employees receive a nice referral bonus to boot. The only problem is getting the employees to set it up to begin with. Their scheduling system is by far the best I've ever seen. The scheduling we do is very complex. We have 2 recruiting coordinators for a 1200 person company. We hire anywhere from 100-150 sales people a month and about 100 product/tech people a year. Our scheduling requires coordinating between several c-level, senior level executives with very limited availability. Some of our interviews take 6 hours onsite and must be scheduled in a specific order. Jobvite's scheduling tool integrates with Outlook and allows us to view availability and book conference rooms right from their platform. 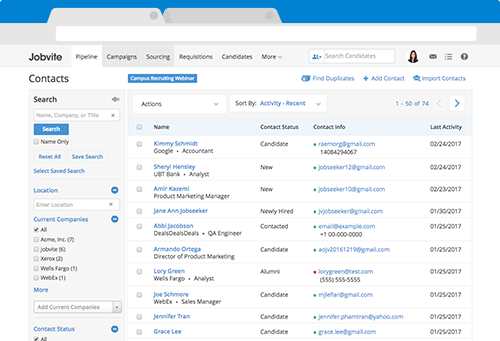 Jobvite allows you to track email communication to candidates. The way they do this is to have all communication go through their email server. The pro to having it setup this way is that they can track all communication with no additional work from the client. The negative to this is that there is a LOT of room for messages to get lost, end up in peoples' spam folders, or for emails to never get to the recipient. They could be lost for several reasons but because Jobvite shows that the message was sent on their end, there is very little they can do to help you resolve the issue. Very limited in customization. While Jobvite does have a lot of great features, there is not one system in the world that will work for everyone. So it's important to be able to openly integrate with other vendors that do specialize in the areas that they are not the best in and to be able to customize certain things like dashboards to fit to each individual company. I have tried to work with several vendors over the 5 years that I have used Jobvite and the one common theme I hear from those vendors is that they integrate with almost every major ATS out there except for Jobvite because Jobvite is difficult to work with. It would also be great to be able to customize our dashboards so different user roles can see only the things they need to see at a glace when logged in. Jobvite only has one dashboard for all users. Reporting is lacking. There is a limit to the fields Jobvite reports on. They have a contacts tab to keep track of your pipeline of passive candidates and there is no functionality to report on any activity tied to those contacts. It's also difficult to report on simple things. Jobvite aims to innovate the recruitment space with Continuous Candidate Engagement (CCE), a candidate-centric recruiting model that helps companies engage candidates with meaningful experiences at the right time, in the right way, from first look to first day. According to the vendor, the Jobvite Platform uses automation and intelligence to increase the speed, quality, and cost-effectiveness of talent acquisition. Focused exclusively on recruiting software since 2006 and headquartered in San Mateo, Jobvite has thousands of customers including LinkedIn, Schneider Electric, Premise Health, Zappos, and Blizzard Entertainment. 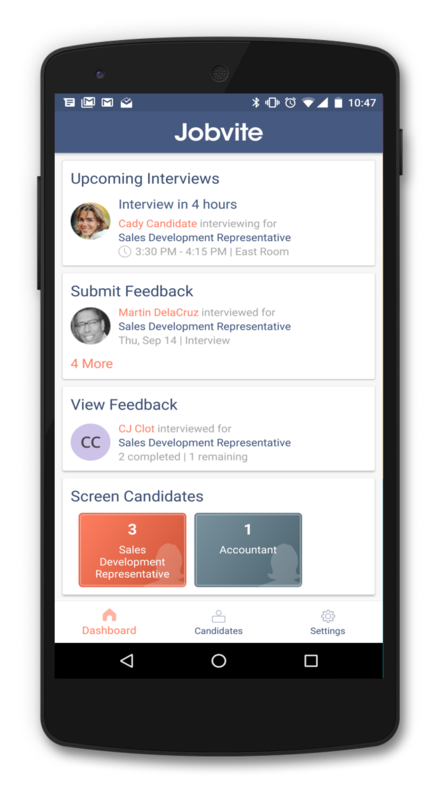 Let applicants apply anywhere with our fully-branded mobile career sites.Start each day off with a high-level view of your most important tasks, reports, and metrics, delivered in an actionable, customized homepage dashboard.Build talent pools, nurture them with campaigns, and increase referrals with Jobvite Engage, our CRM and Recruitment Marketing tools.Centralize all your onboarding activity, standardize processes, and seamlessly transition your candidates, providing them the best experience.Easily communicate and collaborate with hiring managers to screen candidates, manage interviews, and more with the Jobvite Mobile Hiring App (iOS and Android).